I slept in a bit this morning and woke up around 8:30. I had planned for somewhat of a lazy day so I took my time getting my stuff together in my room. I also turned on the TV as I have forgotten at times on this trip that there's other stuff going on than what I'm doing. However, CNN could only hold my interest for so long, so I changed the channel to HBO which was showing the horrendous film from the 90's, Empire Records. Please do not ever watch it...it was one of those movies that is so bad that you can't stop watching it, and before I knew it I lost an hour. It's one of those films that would appeal to some Gen-Xers since it takes all the cliches and stereotypes from that demographic and gives us characters representing each one. (For those of you curious about the film, two of the characters are played by Liv Tyler and a young Ethan Embry). I'm usually pretty easy-going when it comes to movie-watching, and I'll watch just about anything. But Empire Records was unbearable. Maybe it's unfair of me to badmout the movie without discussing the plot or anything like that...but I'll do it anyway. Anyhow, I didn't check out of the hotel until 11AM, which was fine since I wasn't planning anything big for the day. I took my car to a Jiffy Lube just a block down the road, and while I waited for the oil to be changed, I brought my dirty clothes to a laundromat just 2 blocks down the opposite way. Eventually I got the car back (she's doing incredibly well...I can't be happier about how she's handled all this driving in such a short amount of time), got my clothes dried, and then around 1 I got on the road and headed East on Interstate 90 towards Livingston, Montana. Once I arrived there, I'd only have to head south on HWY 89 for just 50 miles or so, then I'd be at Yellowstone National Park. It didn't take long at all to get there...I was inside the Northern park gates by 6. I wasn't sure what to expect of Yellowstone, but after a half hour or so I had a feeling this place wouldn't be on of the major highlights of my trip. I got out at Mammoth Springs to see some small hot springs (most of which had dried up), and it was crazy...lots of people running around, RVs and campers all over the place, and kids screaming. That, coupled with the strong smell of sulfur in the air, forced me to get back in the car and continue further inside Yellowstone. 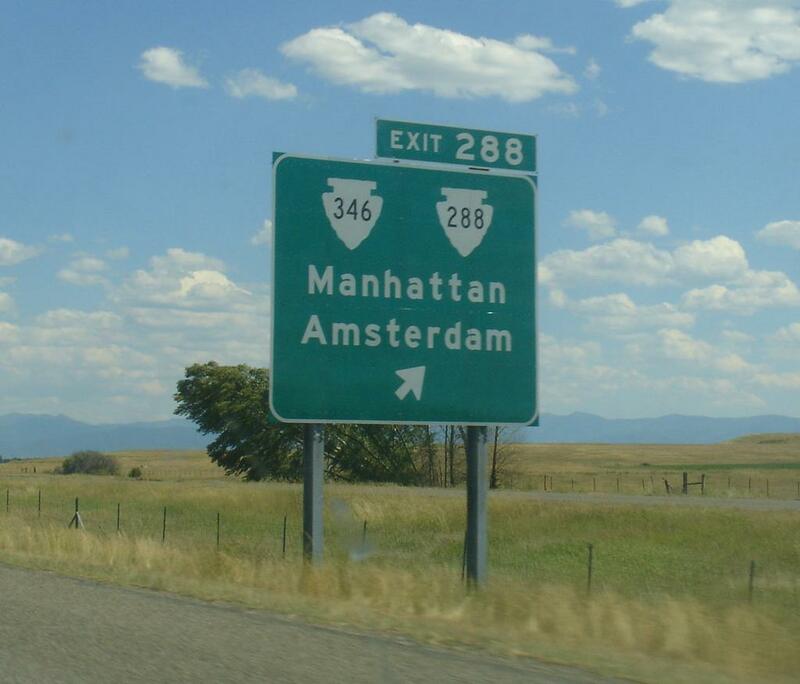 The place is incredibly touristy, and I was finding it less and less enjoyable the more I drove through it. It's cool that you can see elk near the road, and many visitors get to see bison (though I didn't), but the whole time you're surrounded by others snapping photos of these animals. I was spoiled at other parks like Big Bend in Texas where, during the time I was there, I'd see maybe 1 other car every half hour. That's another thing...I've seen some pretty spectacular landscapes on this trip - most recently at Glacier National Park. I imagine it would be difficult for me to be impressed by most parks immediately after a visit to Glacier. 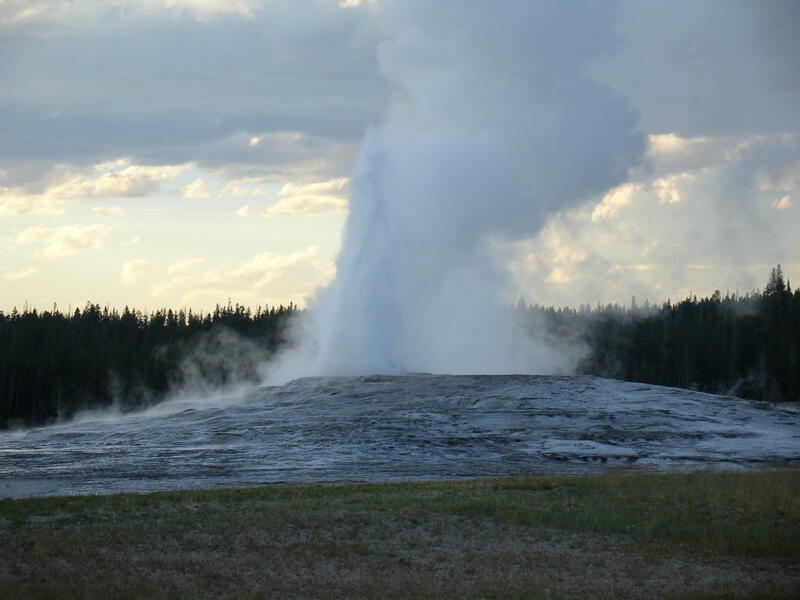 Anyhow, Old Faithful was on my route so I decided I'd stop by and see what that was all about. Around half of this huge geyser was a boardwalk that had benches for people to sit on and wait for the geyser to erupt...there were hundreds there. I arrived at the end of an eruption, which was interesting since I've never seen a geyser, but overall the feeling I had was more like "eh." I could have waited about another hour and a half to see another eruption, but I felt catching the end of one was sufficient. Incidentally, Old Faithful is named not for eruptions that go off in regular intervals - the time between eruptions can be anywhere between an hour and a half to three hours, though 90 minutes is the average; however, Old Faithful is so named simply because it erupts on a regular basis. I continued South through Yellowstone and decided I would exit the park and drive towards Grand Teton National park, the entrance of which was only 30 miles south of Yellowstone. I arrived at Grand Teton around 10PM and soon found a spot in a campground near the entrance. I'm looking forward to seeing this park in daylight. As I drove by a lake an hour ago, I could see the silhouettes of the big mountains across it (thanks to a near full moon). Hopefully, I'll wake up around sunrise, as my phone alarm won't work since there is no service out here. By the way, I don't mean to badmouth Yellowstone and discourage people from coming here...it's a beautiful park and the animals are fascinating, and I'm sure you can get away from the crowds with a little bit of hiking, but to me it just wasn't a lot of fun. Again, my perspective is skewed just coming from Glacier, but I think even if Yellowstone was my first stop on this trip, I wouldn't be all the enthused about it. And I don't want to sound like this was in any way a bad day...it was actually an excellent one. I got to relax in Missoula this morning, I've already visited the world's first national park, and I'm looking forward to a good time at the Tetons. I'm excited that my car has held up so well this far along. Additionally, I've had some great weather on this trip...I really have nothing at all to complain about this whole trip...and for 19 days on the road (with a few stops in between), I think that's pretty good. Happy belated birthday to my brother Mike who turned 26 (I think) on the 18th. And despite what the guestbook may say, Mike and Heather were incredibly generous to me during my stay in Sacramento. Happy early birthday to my mom - it's the 21st.